This is an exclusive offer including a headphone stand and semi-hard case, worth £59. New V3 firmware available to download via control panel enhances microphone volume and clarity, adds an intelligent noise gate for clearer group chat, discord and teamspeak sessions, settings memory and features an additional "warm" sound profile for super-beefy bottom end response. Mobius is the first headset from Californian planar magnetic headphone specialists, Audeze. World renowned in audiophile circles for producing some of the finest headphones on the planet (such as the £3599 LCD-4), they have now focused the same technology into a headset, with some brand new technologies to take immersive audio to the next level of accuracy. Whether you're parachuting into PUBG, legging it from Deathclaws in the wasteland or living the life of a dastardly space pirate in Star Citizen, Audeze Mobius will bring your games to life like you've never experienced before. The planar magnetic drivers give a much more detailed sound than heard in regular dynamic headphones and headsets, the difference is especially noticeable in short, sharp sounds such as the crack of a gun or the crunch of leaves underfoot. Some games have exceptional sound design teams, enjoy the immersive audio as the designers intended. Audeze have gone beyond "virtual 7.1", combining the 7.1 streams with built-in head tracking, anatomy calibration and room emulation. For simulators, this headset is a real game changer - forget strapping head tracking devices to your cans, it's all built-in! While a relatively niche market, accurate head-tracking and 3D audio in simulators makes the world of difference. Your racing and flying sessions will never be the same again. This is particularly fantastic for ultra wide or triple screen gaming, as when you turn your head to look at the side screens, the audio follows how sound works in real life to give you unparallelled levels of immersion. This head tracking means that it is easier to pinpoint the position of sounds by slightly moving your head and not having to move your whole character's perspective in game. Get the edge on the competition. As all of the processing is built into the headset, this processing can be done without lag or latency, or taking away CPU power. 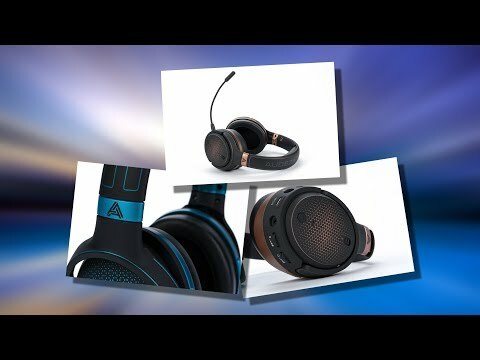 The headset has a noise isolating boom microphone that is detachable and as such Mobius can be used as a regular set of closed back headphones, either over USB-A, USB-C, analogue headphone jack or wirelessly over Bluetooth, with a 10 hour battery life. The headphones support the AAC codec for streaming from Apple devices, whilst owners of recent Android devices can also benefit from the new LDAP wireless audio codec, delivering over 3x the bitrate of Bluetooth audio and apt-X codec. When connected via USB to a compatible device, Mobius shows up as a 7.1 soundcard, so are great for watching films and shows. The words "game changer" are thrown about quite liberally nowadays but these headphones are exactly that, a swiss army knife of multimedia audio! "First, let me say, time to get off the fence as these headphones are certainly the “real deal”! They bring that classic Audeze house sound along for the ride and for me that is very much welcomed! Everything from incredible bass extension, energy and detail to their wonderfully balanced mid-range and extended (though never harsh) treble is spot on. The head-tracking is what really makes these very special headphones. It keeps the sound stage in front of you and as you turn your head, that stage stays right were you set it (with the click of the <3D> button on the right ear cup). Initially it took about 5 -10 minutes to get used to, but once I did, it was hard to go back to regular headphones. If you’re in a car and changing directions because the car is moving, no need to worry as you can turn on 3D auto centering and the headphones will ensure that they only head track your neck movements and not the automobile’s. The Bluetooth performance is also top shelf and the wireless functionality never cut out. Couple this with outstanding sound quality that we’ve come to expect from any release from Audeze. If that wasn’t enough, the Mobius headphones support high resolution LDAC data transfer from a capable device, these headphones really have it all!"